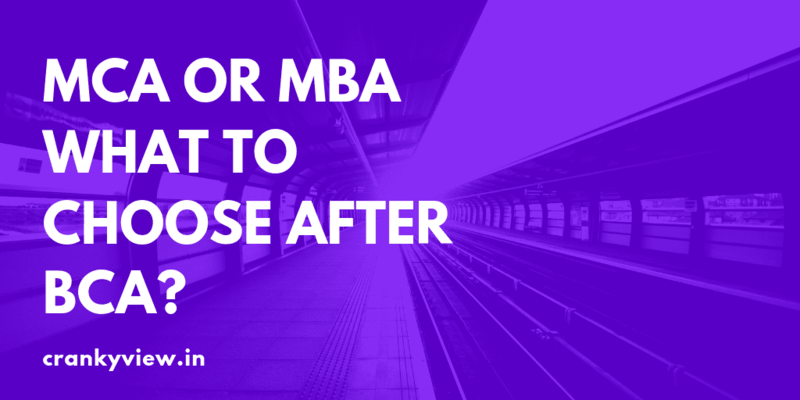 MCA OR MBA What To Choose After BCA Explained! Home » College » MCA OR MBA What To Choose After BCA Explained! Indeed it is the most difficult decision choosing between MCA or MBA after completing BCA and it is one of the most searched questions on the internet. MCA (Masters In Computer Application) and MBA (Masters In Business Administration) both courses are good and different from one another. In this Post, I will talk about which course might suit you and which might not and what are the job opportunity after MCA and MBA or after BCA. So stay with me. One of the most sought courses some Bsc Computer Science students also choose MCA for post-graduation. Its 3-year course but the course gives you in-depth knowledge about computer application mostly programming languages, algorithms, and Computer Architecture. After completing BCA if you still want to know more about your favorite subjects then MCA is the best choice for you, go on for that. But if your interest in computers in dwindling then you should not choose MCA for post-graduation. There are some people who compare MCA with Btech in computer science and often say Btech and MCA have the same value, But I don't agree on that statement. If you think about it you can see Btech is an engineering degree and on the other hand, MCA is not an engineering degree where you learn mostly about programming languages and algorithm and how to use them. Here you learn about management and accountancy along with the other core subjects. If you are thinking that you will not get a job after completing MCA then you are very wrong. Getting a job totally depend on your quality, how good you are in coding and how much you know about the subject. I have read many Quora answers on the same topic and there are some antique pieces, who claim they didn't get a job after MCA and its the worst decision to choose MCA for future studies. I would say just don't listen to them. It's all your decision. There might be a possibility that you didn't get a job in MNC from you college at one chance but you got a developer job in a small company then there is no problem unless its a developer job. You can work in that company gain some experience and then you will definitely get a chance to join an MNC. If you are more concerned about your salary then you will get the same salary what a Btech candidate gets as a fresher. But after 1 year or 2 years of experience, you will get more job opportunity with a much better salary. Everything you will learn is about management as the name suggests you will learn the fundamental principle of management like Planning, Staffing Directing, Controlling, and Organizing a business most of the time you have to deal with the peoples and business person. There are many fields of MBA like Finance, Marketing, Systems/IT, HR(Human Resource), and if you see your self as a person with good communication skills and have a good skill to convince customers then MBA is the best choice for you. But keep in mind if you complete your MBA from a regular college then you might not get good placement, and the average salary you might get will not be more than 3L per annum. It's always a better choice to look for a good college and rather than choosing a normal college. JOB AFTER BCA? What About That? Great if you got a job offer after BCA and if it's a developer job! Now you are thinking to join it. I would recommend you not to join right now and go for further studies. But If you don't have financial support or want to gain experience then you can join. But normally BCA and Btech freshers get a support job as fresher if you have done your graduation from normal college. Hence gaining experience in IT support work doesn't make any sense to me. Rest is all on you.